85 sqm renovated, kitchen, large and bright living room, two bedrooms and two bathrooms. Large balcony with garden views. 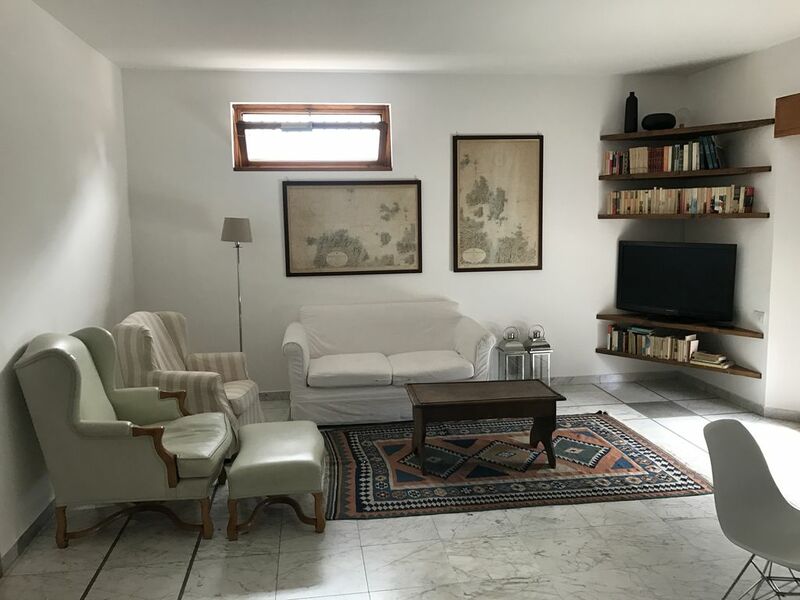 The apartment is located in a small and quiet apartment building of seven apartments, just a few steps from Borgo Santa Caterina, one of the oldest hamlets in Bergamo, full of restaurants, pubs and artisan and commercial activities. Within a few minutes walk you can reach the historic center of Città Alta (20 minutes), GAMEC, the Carrara Academy (10 min) or the Stadium (10 min). Closed and private car boxes complete the offer. Ideal for families, with playground for children and reading corner. Modern apartment with all amenities.Easy walk to Citta Alta attractions. Lots of shopping and restaurants close by. We enjoyed the interaction with Gian and his family. We were grateful for the information about Bergamo he provided us on our arrival. Property was exactly as shown. Had a great time and Gian was extremely helpful. Best vacation. Gianandrea and his wife were very helpful. We enjoyed meeting their baby and dog. The apartment was clean with modern kitchen appliances and other amenities. It is well situated for exploring both the upper and lower city. A hidden advantage perhaps is its proximity to Lake Iseo, a less known one than Garda or Como but well worth the visit. Our suggestion to HomeAway would be to find some way on your web site to clarify for people like us [less experienced users of your type of service] to understand that initial credit card attempts may be rejected and the client needs to contact their credit card company to allow the transaction to occur so as to avoid frustration . Nous étions 4 adultes et avons passé une semaine très agréable dans cet appartement confortable et très bien situé qui dispose, outre un garage, d'une possibilité de parking extérieur. Les propriétaires habitent sur place et sont des gens charmants toujours prêts à aider leurs locataires. Le confort est grand et tout l'ensemble de l'appartement est de bon goût. Nous ne saurions que recommander cet appartement à tous ceux qui veulent découvrir les merveilles de Bergamo. De nombreux petits magasins situés dans le voisinage permettent sans difficulté d'aller s'approvisionner. Als ich die Bilder dieser Wohnung sah, dachte ich: OK, schöne Bilder. Aber wie das wohl in echt aussieht? Als ich dann ankam, stellte ich fest: Das sieht wirklich so aus: Sauber, gut ausgestattet (incl. Handtücher & Bettwäsche), modern eingerichtet. Und das ganze zu einem moderaten Preis und in (20 min) fußläufiger Entfernung zur Altstadt. Weiterhin sind alle Geschäfte des täglichen Bedarfs in kürzester Zeit erreichbar. Wir waren mit 4 Personen und einem Hund da und waren alle miteinander begeistert. Bei Problemen und Fragen steht der (immer freundliche) Vermieter auch englischsprachig zur Verfügung und hilft sofort. Fazit: Perfekt! Wenn wir wieder einmal nach Bergamo kommen sollten, dann in jedem Fall wieder hierher. So. Jetzt noch für alle Misstrauischen, die zu guten Bewertungen kritisch gegenüberstehen und Fakes vermuten: Diese Bewertung ist kein Fake! Es war einfach alles super. Mir fällt einfach nichts schlechtes ein. Wenn Ihr trotzdem misstrauisch seid: Pech gehabt. Dann geht halt woanders hin und sucht Euch was, wo Ihr danach meckern könnt. Hier jedenfalls nicht. Heerlijk licht, ruim en schoon appartement! Het appartement ligt in een prettige wijk, naar de oude stad lopen is een mooie wandeling. Wij waren hier in de herfst en hebben heerlijk in het zonnetje op het ruime balkon kunnen zitten. De eigenaar woont een verdieping lager en is vriendelijk en gastvrij. Kortom een prima plek om te verblijven. you know that your opinion is very important for us and for future success of Villa Franca. Why didn't you consider 5 stars? From your words, looks like you had a very good experience.